One day, as I was playing with paper with my then 6 year old son, he asked me to build him a house. I immediately thought of the origamic architecture cards by Masahiro Chatani. From a single sheet of paper Chatani could make staircases and buildings pop up then fold back to nothing. The idea of a house which could be closed flat and slipped into a bookshelf for storage was very appealing — dust covered clutter accumulates like flotsam in my kids’ room. I had quit my job to take care of the children and I was desperate to exercise my brain. Since I felt guilty spending hours doing stuff for myself, I pretended that I was making things for them, and I designed eight rooms — though it was quickly evident to everyone I wasn’t really doing this for the kids. My six year old had lost interest about 5 minutes after I began the project, and it took me months of stolen hours to complete a complete house. My first version, like Chatani’s cards, was made of a single sheet of paper, but I realized that to be a useful toy the pop-ups needed reinforcement. About a year after making the first version of the house I decided to improve the strength of original design by using two interlocking pop-up cards for each room. Hoping for mass production, I filled the house with 100% IKEA furnishings and decorations. 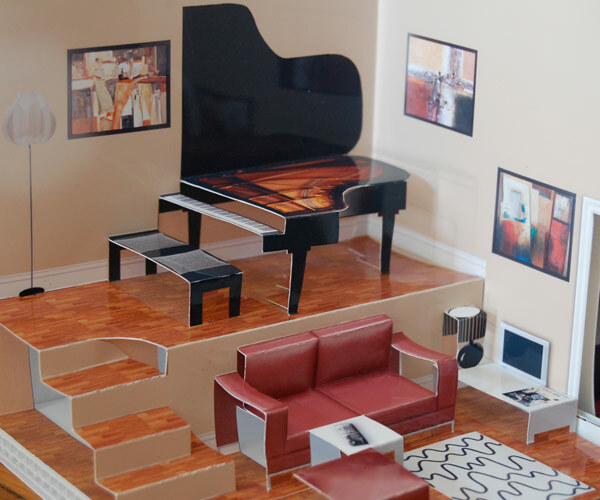 My idea was to sell them the design; IKEA would manufacture the paper house (if mass produced it would be incredibly cheap) and distribute it all over the world. It seemed so perfect for them! Wholesome, inexpensive toy, folds flat, features their furniture, rugs, accessories and lights — I could design a new version every year with their new collections, catering to kids’ compulsion to collect. 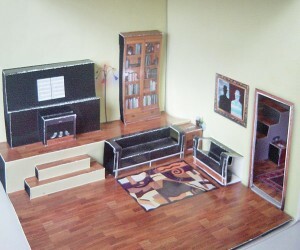 This living room has IKEA artwork, carpets, lights, and even an IKEA catalogue on the coffee table. I’d be set for life. I fantasized about giant pictures of me hanging from the ceiling in IKEA warehouses with snappy little quotes about my philosophy of design. I thought some excited Swede would call and fly me to snow-covered Almhult, but instead I just got the cold shoulder. An unsigned form letter saying “thanks for whatever it was you sent, but no thanks”. 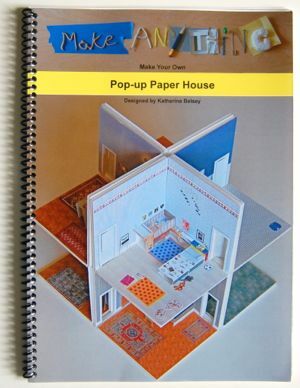 I didn’t have the means to manufacture, market and sell the finished house myself, so instead I redesigned it for the third time and deleted all things IKEA (not out of bitterness, just for image rights purposes) and turned it into a book of templates to be printed on demand. By then I had realized that half the fun was to make the house, so this final version was laid out with instructions so anybody could build it with a few simple tools and materials. Freed from the constraints of IKEA design I could now fill the rooms with artwork by my relatives: Alexi Worth is my brother in law, Mark Rothko was my great uncle, but there are also pieces by my children, some of my own pop-ups, and a sculpture by my great grandfather Meyer Sachar, an upholsterer by trade. Friends and strangers alike would tell me they loved the house — but that it was too daunting a project to undertake. I decided to take it one step further and make a kit. By then Kickstarter had burst upon the creative scene and I was able to raise the necessary funds thanks to over 600 generous and very diverse backers. You can learn more about the adventure of the kit production by reading through the updates of my Kickstarter campaign.